Invictus Games Orlando 2016 for Our Wounded Warriors will be held May 8-12, 2016, at the ESPN Wide World of Sports Complex at the Walt Disney World® Resort in Lake Buena Vista, Florida. 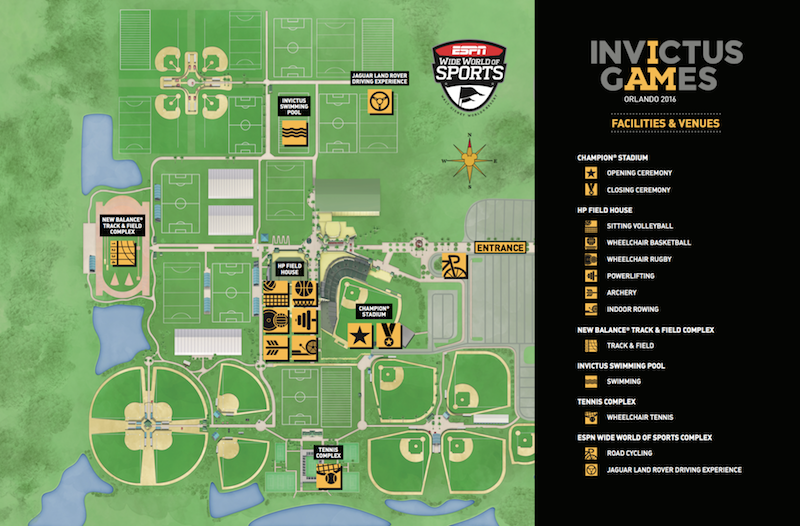 Competitors, live audiences and those watching the 2016 Invictus Games at home will be treated to the world-class venues of the ESPN Wide World of Sports Complex, the pre-eminent multi-sport facility of its kind. Having hosted more than 70 different sports featuring competitors from more than 70 different countries, including events for wounded military veterans, the 230-acre Disney facility is uniquely positioned to host a global event such as the Invictus Games 2016. Learn About the ESPN Wide World of Sports Complex.